Is music learning only for rich people? We assume that the initial investment cost for piano is not so much expensive compared to other culture lessons or sports such as football, ballet. 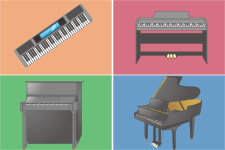 This time, we would like to compare the functions of 4 types of pianos, from electronic keyboards to grand pianos. One of the role of electronic keyboard is to help children enjoy music in a casual and light-hearted manner. It might encourage them to enjoy and to feel the beauty of sounds wherever they want, whether in dining rooms or in family rooms. It produces sounds of piano, as well as those of other instruments, drums, hand-crapping, or even voices of animals. Children can also enjoy learning rhythms. The breadth of the keyboards is same as that of acoustic pianos, therefore little kids can get used to keys and chords to shape their physical senses over keyboards. If you want to choose one, you would better consider the number of keys, function of speakers, pedals, and whether ways of keystroke can change the dynamics. In recent years, electronic piano has been developed rapidly due to the innovation of digital technology. It allows repeated keystrokes more efficiently, and reacts to the depth of pedaling more sensitively. It also enables players to choose sounds, to record and replay, to do automatic accompaniment, etc., which are unique functions of this instrument. Since it is much lighter than acoustic pianos and has a variety of designs, it can fit into any room interiors easily. If you want to choose one, you would better to check up the mechanism and quality of audio samples, keyboard / action function, production system of sounds, effect of pedaling, chairs, etc. Upright piano is one of the acoustic pianos. When you play keys, the power reaches action, hammer strikes strings, soundboard amplifies the vibrations of strings, and yield the sounds. Other strings also resonate at the same time, and that makes the sounds richer. Sounds differ according to the usage of fingers, wrists, and shoulders. Therefore, one can practice technical exercises with more sensitivity, such as making beautiful phrases with flawless slurs, long and short staccatos, well-balanced chords, etc. About 300 years ago, the original form of grand piano was created, and it has been renovated over the years. The action mechanism and functions have already established and it has not been transformed over 100 years. Then, what is the difference between grand piano and upright piano? First, the quality of action mechanism is higher than that of upright piano. When you play keys, the power reaches action and strings flawlessly. It allows us to play faster keystrokes (grand piano: about 14 keystrokes per second, upright: about 7 keystrokes), to make sensitive expressions such as legato with small sounds, ff without extra force, etc. Secondly, pedals are also different. Both have 3 pedals each, but the functions are different. The pedals of grand pianos (damper pedal, sostenuto pedal, shift / una corda pedal) enable us to change the sonority in order to fully express what composers intended. Lastly, the size and the length also matter. As the grand pianos have larger soundboards and longer strings, they have better balanced tensional force, and that help us gain rich sonority. Thanks to those functions, we can deliver the inner messages of music with wider dynamics and plentiful sounds.